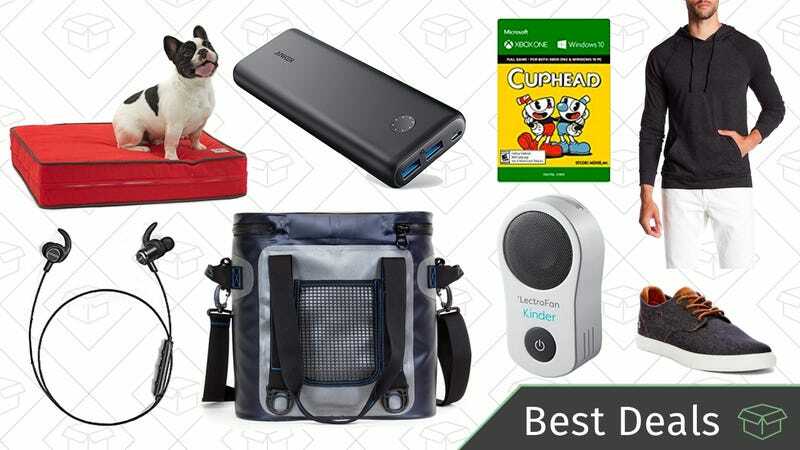 Nordstrom Rack’s uber-popular Clear the Rack sale is back, plus find discounts on reader-favorite RTIC coolers, Anker Bluetooth earbuds, and more. Anker’s PowerCore line of battery packs have been our readers’ favorites since they debuted, and now you can get the new Anker PowerCore II 20,000 for $36 with enter promo code ANKERPC2. Cosmetically, the PowerCore II look very similar to the original PowerCores, but with more precise eight-dot charge indicators so you know how much juice you have left. But inside, they’ve been upgraded with Anker’s new PowerIQ 2.0 charging technology, which delivers the fastest possible charging speed to your devices, including Quick Charge-compatible phones. That speed works both ways, as the entire battery will recharge in five hours if you plug them into a QC wall charger. Our readers voted Anker’s SoundBuds Slims as their favorite affordable Bluetooth headphones, but we may need a recount, as Anker recently released the upgraded SoundBuds Slim+, on sale for just $22 today with promo code LGVDRPV3. The biggest change from the original model is the inclusion of AptX encoding, which should improve sound quality with compatible devices. Anker also claims that waterproofing has been improved, though they’re both still rated as IPX5, so any change on that front is likely modest. One thing that hasn’t changed: the seven hour battery, which is excellent for earbuds of this size. The recent release of Qi-compatible iPhones means that wireless charging pads are flying off the shelves, and you can score Anker’s 10W model for $8 off today with promo code ANKEBEST. Get your pup in on the biggest trend of the last 5 years by picking up this memory foam dog bed. Featuring 5" gel-enhanced memory foam, today only, grab a small for $56, a medium for $74, or a large for $105, in a ton of colors and patterns. Give your good dog what they really deserve. Everyone should see the northern lights at some point in their life, and they’re closer than you might think with this vacation package from Gate 1 Travel. Starting from just $699 per person (after $130 off promo code TZWCNL), you can get roundtrip flights to Reykjavik, a three night hotel stay, breakfasts, and a guided evening tour of the northern lights (subject to weather). Packages are priced from New York by default, but you can select almost any departure city, and that promo code will still apply. It doesn’t have the name recognition or wireless connectivity of Anova, but this Aicok sous-vide circulator is incredibly affordable at just $58 (with code 3W7AOILO), if you’ve been curious to try out sous-vide. Lifehacker has a great explainer on Sous-Vide cooking for you to check out, but the basic idea is that you seal the food in plastic bags, and then cook it in precisely heated water over a longer period of time. It sounds weird and vaguely alchemical, but the result is meat (and other stuff, too!) that’s cooked to the exact right temperature all the way through. Pizza wheels are much more versatile than you may think. You can use it to slice up veggies, cookie dough, or herbs. This $9 Joseph Joseph pizza cutter makes cleanup easy with a detachable blade you can just run under the sink or throw in the dishwasher. It also has a blade guard, so you can keep all your pizza-eating fingers intact. Today’s price is the lowest we’ve seen since August. Even if you don’t do much DIY work, you should probably have a screwdriver extension shaft in your toolbox. These let you access awkwardly placed screws that regular screwdrivers can’t reach, and this $10 one even comes with a full set of bits. Hang up some new data-driven wall art for about half the price with these Pop Chart Lab posters from Woot. They have several alcohol-related posters, like beer and whiskey infographics, 99 bottles of beer scratch-off chart, in addition to the history of space travel, and more (scroll to the bottom). They’re all between $15 and $19, and the exact same posters are selling for around $30 on Pop Chart Lab’s website. As with all Woot deals, Amazon Prime members will get free shipping, and non-members will pay $5. Attach this portable foot hammock under your desk at the office, under the tray table on your next flight, or anywhere where else where you might be sitting for a long period of time. Today’s $5 price tag matches its all-time-low, so you might as well give it a try. Rarely under $400, you can buy this Vitamix 5200 for just $320 today. Our readers listed this blender as one of their favorites because it’s nearly impossible to break and has the horsepower to cut through pretty much anything you throw in there. It’s been as low as $300 a few times in the last few months, but today’s deal is still $80 less than usual. Just in time for spring, Amazon now makes its own outdoor string lights, and you can grab a strand for an all-time low $31 today. Each strand is 48' long, weatherproof, and holds 15 incandescent bulbs. Plus, the cords are rated for enough power to chain eight of them together into a 384' mega-strand that could light up your entire backyard. With a reliable motion sensor and an easy-to-charge battery pack, I’ve put OxyLED’s T-04 light strips in every closet of my apartment. I might just have to rip them out now though and replace them with this new model, which features a warmer color temperature, in addition to all of the old model’s features. After the 20% off on-page coupon and after entering 25OFFKINDER at checkout, the price on this portable, phone-controlled white noise machine and night light is down to just $48. Designed to be used in kids’ rooms, this LectroFan plugs into any normal outlet, can play pre-installed lullabies along with the usual nature and fan sounds, and can be controlled via your smartphone. Plus, it doubles as a night light. It’s a parent’s dream, and today’s price is the lowest we’ve ever seen. Electric arc lighters are so...hot right now. But this model from Tacklife is about the size of a USB flash drive, making it one of the smallest on the market. I own it myself, and it works great. Just $10 today with promo code C2E85A9F. Sometimes the only thing you need you need to make a good mattress a great mattress is a topper. These Lucid 3-inch thick mattress toppers are made with memory foam gel and have an impressive 4.2-star rating nearly 4,000 reviews. The price on the queen size has been cut down by about $25 and the king is down over $30 in today’s Gold Box, but these prices will only last until the end of the day, so don’t sleep on it! This tiny tire inflator has been a hit with our readers, and now you can get it for just $12 with code X4Z9IEEU. Toss it in your glove box, or even in your spare tire well, and you’ll never again be forced to scrounge together quarters to use the air pump at a gas station. If you have any trips on the horizon, you can save 15% on your choice of hotel stay through the end of the year with promo code TravelocitySpring15. The asterisk here, and it’s a fairly big one, is that most major hotel chains (except Hyatt, notably) are excluded. But most cities have at least a couple of Hyatt properties, or you could use this as an excuse to try a cool boutique hotel that you might have otherwise missed. There are no blackout dates, but you will have to prepay for the room (you can cancel for a full refund), and your discount is capped at $75. Bon voyage! Here’s something to brighten up your day. A 16-pack of soft white LED lightbulbs is only $22 today on Amazon, meaning you can upgrade your entire home to LED. Plus, some utility companies offer per-bulb rebates, so they could get even cheaper. Want daylight bulbs? That pack is just $1 more. Vacuum insulated bottles are nothing new. But, this new Thermos gets interesting when you consider the bottle’s leakproof silicone cap, which will trap in carbonation too. With a 17 ounce capacity, this will hold about 1.5 La Croixs, so you can feed you ice-cold sparkling water (or beer, soda, etc.) addiction on the go. It normally sells for closer to $20, so today’s price should make you feel bubbly. For $12, you can own a real life book safe, just like the movies. The best part is that you don’t have to worry about someone stumbling upon it by mistake, because nobody actually uses printed dictionaries anymore. You love Lodge’s cast iron skillets, but have you tried their dutch oven? It’s only $32 on Amazon today, the best price in over a year. And while it’s an excellent dutch oven, its coolest feature is actually its lid. Just flip it over, and you’ve got yourself an extra cast iron skillet. That’s two great pieces of cookware for the price of one. Get a grasp on these kitchen tongs for just $10 today, which is a good $7 less than usual. They have silicone grippers so they won’t risk scratching up your nonstick pans, and this set comes with three pairs, so you’ll be fully stocked. If spring allergies are already ruining your day, you can fight back and decrease the amount of air pollutants you’re breathing in with this very well-reviewed air purifier. The Levoit LV-132 features a True HEPA filter (a big deal at this price) and charcoal filters to reduce pet odors and neutralize airborne bacteria. Plus, it has an impressive 4.4-star rating with over 1,400 reviews. This model normally bounces between $80 and $90, but is only $71 after 5% off coupon. Yes, it’s already happening again. Nordstrom Rack has brought back their Clear the Rack sale and it’s full (and I mean FULL) of really incredible deals. Designer clothing, brands you’ve never heard of, everything in clearance an extra 25% off. RTIC’s Soft Packs are our readers’ favorite coolers, and the newly redesigned models are back on sale for the first time in months, if you’ve had them on your wish list, or if you want to give them as a gift this holiday season. The smallest RTIC 20, which can hold 20 cans plus ice, is down to just $88, from its usual $110. The RTIC 30 and the massive RTIC 40 are also down to their best prices since the holiday shopping season. I personally own the 20, and I can tell you from experience that it really does keep ice frozen for days on end. These coolers hardly ever go on sale though, so grab one before this deal melts away. Privé Revaux turned the sunglass industry on its head last year with a wide variety of attractive frames for just $30 each, but you can get them for even less today with this 25% off deal. Over on their site, you can also browse over 100 styles, and get any pair you want for just $23 with promo code SPRING25. Pushups + capitalism = These things. But seriously, Legend Pushup’s push-up bars really do promote proper pushup form while taking the strain out of your wrists. They also have two different modes depending on how they’re oriented, rocking and stable, to accommodate different exercises. $20 is the best price Amazon’s ever listed on these. Not to alarm you, but swimsuit season is fast approaching. If you’re looking to get your body back in shape, this $40 Core Max ab machine might do the trick. With adjustable arm resistance, you can tailor your workout to your fitness level. Although it’s advertised as an ab machine, it’ll workout your arms, glutes, pecs, and more (see third photo on Woot for details), and folds up for easy storage. This deal will only last through the end of the day or until the product sells out, so don’t let this deal run away from you. When it comes to having a corner on the market, nothing really compares to Nike. And right now, over 4500 styles for all occasions are up to 40% off for both men and women, no code needed, as new year deal. Everything you could need for a good workout wardrobe is included, from apparel, to sneakers, to gear. I have painful, yet fond memories of my college’s Athletic Trainer using one of these on my thigh after I suffered a strained quad. They are hell while using it, but heaven afterwards. And for $11 when you use the code ALPUMGGO, this muscle roller can help further your love-hate relationship with working out. You won’t have to empty your Gringotts vault to afford this 8-film Harry Potter Blu-ray collection. It’s not the very cheapest we’ve seen, but its discounted from its usual $70 to just $58. So, that means you’ll pay just $7 per movie, no magic required. A must-own for any browncoat, Firefly’s feature film epilogue Serenity recently got a 4K Blu-ray release, and it’s down to an all-time low $15 on Amazon right now, complete with a regular Blu-ray and a digital copy. Now if we could just get the same treatment for the show. Or, you know, a new season. If you can’t get your hands on an SNES Classic, the nostalgia kick you’ll get from this book is the next best thing. Playing With Super Power is the definitive book on the SNES, featuring beautiful artwork, historical accounts, and even a foreword by Reggie Fils-Aimé. At $10, the paperback has never been cheaper. Cuphead is simultaneously one of the best looking and most brutally challenging games of 2017, and you can pick up an Xbox One/PC download from Amazon today for $17. Don’t say I didn’t warn you. If you own a Nintendo Switch, buying a copy of Super Mario Odyssey is basically a requirement. If you don’t have yours yet, Amazon’s offering a rare discount down to $49 today on both the physical and digital version, one of the best prices we’ve ever seen. If you buy the digital code, you’ll also get 300 Nintendo Gold coins, worth $3 on the eShop, versus just 60 coins from the physical version. While most mechanical gaming keyboards look like props from a Transformers movie, Logitech’s G610 would look right at home in a nondescript office, and Amazon’s offering up the red switch models for an all-time low $60 today, which is one of the best prices we’ve ever seen on any keyboard with genuine Cherry MX key switches. Despite the nondescript look, the G610 still includes per-key customizable backlighting and programmable macros, so you should be able to get a lot out of it.